DartMan v2.1.0.0 has been released! This release includes a number of bug fixes. The main new functionality included is the addition of online play. 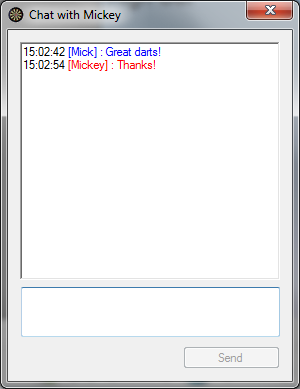 This feature allows players to play against other DartMan players who are logged into DartMan. If the Online tab is not visible, click the Connect button, and log into DartMan. If the remote player accepts the request, then you will be informed of this, and can commence the game. If you wish to play using WebCams to show your board, and see your opponents board, you can tick the Require WebCam check box. Once a web cam game is accepted, you will have the option to Launch Video - this will open your browser and navigate to a video chat service, and open a specific room that only you and your opponent will be a member of. 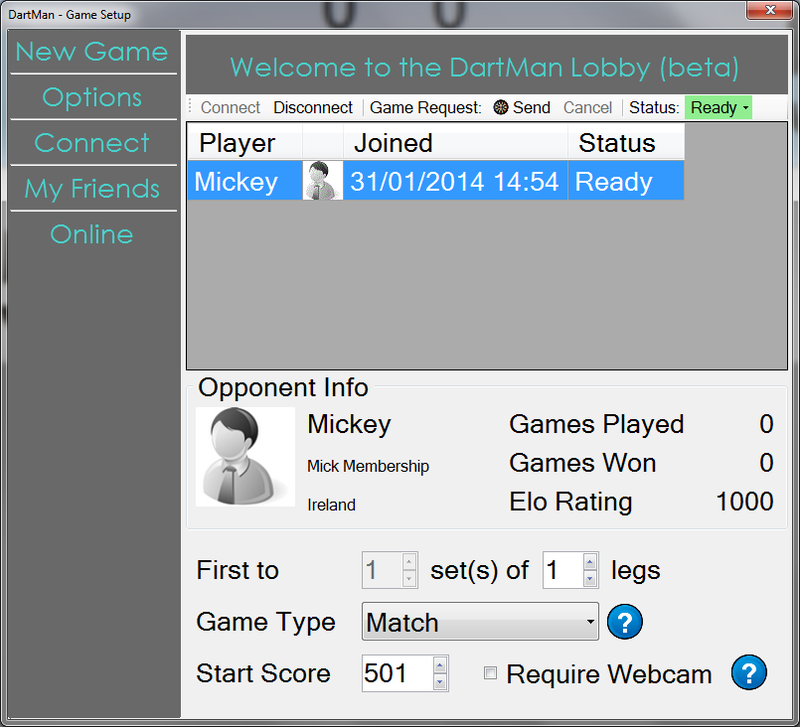 If you use this approach, DartMan can automatically switch between the WebCam view of your opponents board, and the DartMan scoring application, depending on whose turn it is. If this is failing, you can negotiate with your opponent to use Skype, or some other video chat service instead. Just type a message, and click Send of press enter to send it. When it is your opponent's throw, you must wait until they enter their score, and then it will appear on your screen. Remember, this is new functionality, and is a BETA version, as it requires extensive testing and feedback! Please feel free to provide feedback on it's performance and your experiences using online play, as well as any suggestions in the comments section below. All feedback is greatly appreciated. DartMan will automatically update when you launch next. Added online play. Ability to play other DartMan members anywhere in the world. Added the display of possible check outs once one player has a possible out shot. Fixed a bug which meant that 180 scores were not called out. This is because there are 3 variants of the 180 audio file. So one of these will randomly play now instead. Fixed a bug on the View Game screen caused by inconsistent data which was unhandled and cause the leg not to display. Set the date range in the Stats Page so that the start date is the date that the player registered.